(by Patrick Sawer, London’s Daily Telegraph) Leuven, Belgium — Two British business travelers suffered severe and “life-changing” injuries after being caught by the full blast of the Brussels airport bombing. The two men, who were understood to be traveling together, suffered burns, shrapnel injuries and fractured limbs when the jihadi terrorists set off home-made bombs in the departures hall. The pair asked for each other on being admitted to hospital, where they both underwent extensive surgery following the attack on Tuesday and were being operated on again on Wednesday to remove more pieces of shrapnel. 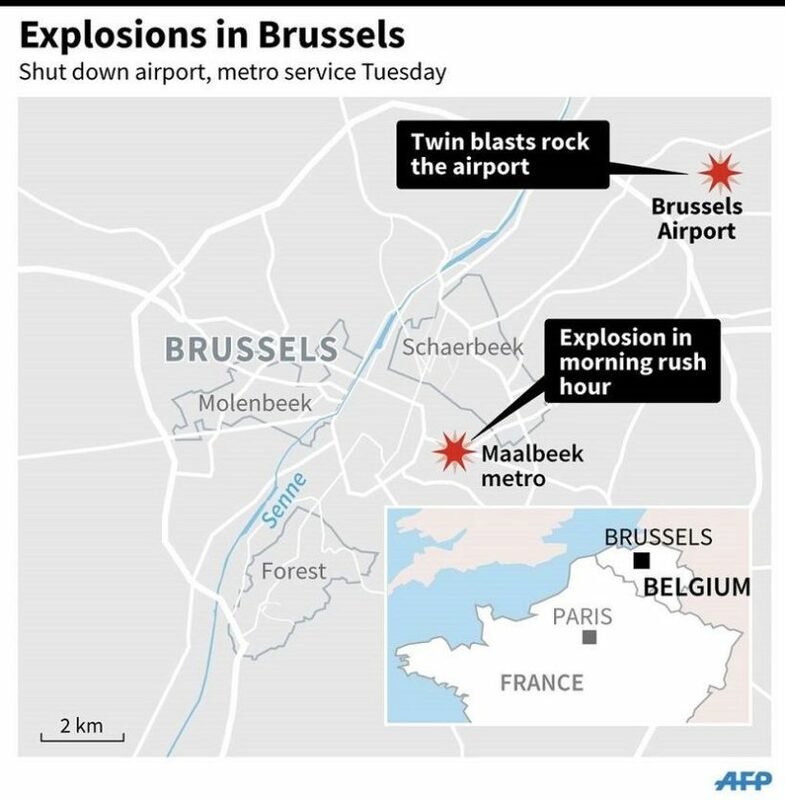 The men were among 24 badly wounded people admitted to Leuven Hospital, one of Belgium’s largest, with a catalogue of horrendous injuries following the attacks at the airport and Maelbeek Metro station. They include a three-year-old girl and her five-year-old brother and their mother. The girl was being treated in the hospital’s intensive care burns unit but is expected to survive, as are her brother and mother. On Wednesday, the British men’s courage and determination in the face of their dreadful injuries was praised by the lead surgeon at the hospital. The less injured of the two men is aged 45. One of his legs was broken in the explosion and he suffered severe burns and shrapnel injuries when the bomb blast sent pieces of metal, bolts and screws flying into the bodies of passers-by. He has managed to speak to his brother by telephone and reassure him about his condition and even managed to joke with doctors about his injuries. The other man, who was visited by anxious members of his family on Thursday, is in his 40s and had both legs broken in the blast. His injuries were so severe it was feared he would lose one his legs. Fortunately surgeons managed to save it, after reconnecting and repairing his veins. He is also being kept on oxygen, after the explosion burnt his throat and caused swelling to his lungs, making breathing difficult. Like all the patients admitted to Leuven – who were visited on Thursday by the Belgian King Philippe and his wife, Queen Mathilde – both men face months of rehabilitation while their wounds heal, particularly the burns to their hands and faces. King Phillipe and Queen Mathilde of Belgium have been visiting survivors of the Brussels attacks at one of the hospitals where the wounded are being treated. Dr. Nijs said medical staff were stunned at the extent of their patient’s injuries and said the bombs had been built in order to create maximum damage to the human body. By a stroke of fate one of his surgeon colleagues had experience of treating battlefields wounds in Afghanistan. He said: “All the patients have big, horrible wounds caused by the pieces of metal in the bombs. All the patients have life changing injuries. Even on the battle ground you have more respect for your enemies than what has been done here. A 17-year-old American student was among the most severely injured being treated at the hospital. She suffered shrapnel wounds to her spine and legs and is still fighting for her life. “If she survives her injuries it will be severely life changing,” said Dr Nijs. Leuven Hospital is also treating Spanish, Swedish, Congolese, Turkish and Indonesian travelers caught up in the attacks, as well as Belgian nationals. Doctors are particularly concerned about the threat of infection to wounds caused by blunt metal objects tearing through the body during the blast. In some cases they will be unable to remove all the shrapnel form the terrorist’s victims for fear of causing further damage. 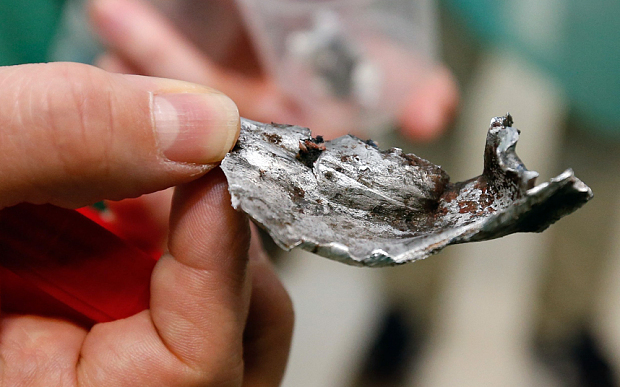 X-Ray and CT scans revealed that some patients have as many as 100 pieces of metal inside them, some barely a few millimeters in size. The explosions also caused severe eye injuries to many of the wounded. Two victims lost an eye and six others have “penetrative eye injuries” and may lose part of their sight. Others also suffered temporary hearing loss from the shock wave of the blast. Dr Nijs said: “These levels of war injuries are fortunately exceptional in Belgium. We were afraid we’d not be able to do this [cope] with mass casualties, but we were able to free nine surgical theaters and nine surgical teams and all the injured had the same standard of care. The professor added that the wounded appeared surprisingly calm on their arrival at the hospital, 10 miles from the center of Brussels. Reprinted here from London’s Daily Telegraph for educational purposes only. May not be reproduced on other websites without permission from the Daily Telegraph. 1. a) What types of injuries have those injured (including two British businessmen) in the ISIS terrorist attack in Brussels sustained? b) List the injuries people have, as described in this article. 3. What did the terrorists put in the bombs they used in their attacks on travelers in Brussels? 4. How does Prof. Stefaan Nijs, head of trauma at the Brussels hospital treating many of the wounded, describe the British victims’ reactions to their injuries? 5. What did Dr. Nijs say about the bombs the Islamic State terrorists used in their attacks? Be specific. 6. The doctor says the victims face months of rehabilitation while their wounds heal, particularly the burns to their hands and faces. Some may not survive. As of Monday afternoon, the number of people killed in the terrorist attack is 35; four of those are American. More than 300 were injured, many with critical injuries. a) The purpose of the U.N. (from its website) is “to bring all nations of the world together to work for peace and development, based on the principles of justice, human dignity and the well-being of all people.” How effective do you think the United Nations has been in slowing, curbing or stopping these Islamic terrorists around the world? Explain your answer. b) What should the leaders of the world do to address this horrific threat to us? What should President Obama do? Explain your answer. What do you think of Mr. Trump’s comments? CHALLENGE: Do an internet search to see what Republican challenger Ted Cruz and Democratic candidates Hillary Clinton and Bernie Sanders have said when questioned about possible response to ISIS attacks. With which candidate do you agree? Ask a parent the same question. Discuss your answers.